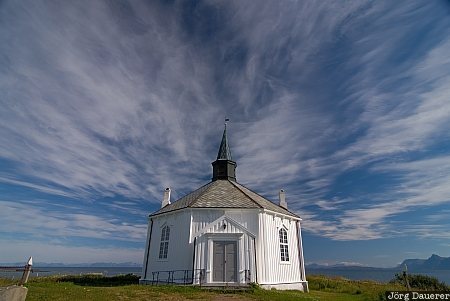 The white wooden octagonal church of Dverberg on the Island Andøya which is part of the Vesterålen in front of white clouds and blue sky. Dverberg is in the province Nordland in northern Norway. This photo was taken in the afternoon of a sunny day in August of 2010. This photo is part of the exhibition Lonely Chapels (October 2010). This photo was taken with a digital camera.